Two questions: what is it about the flute that attracted (and continues to attract) French composers, more so than say, central Europeans, or Scandinavians? And on a related note, is it possible to write a ‘profound’ flute concerto? I shall address the latter point in due course, but with regard to the former there is obviously a readily identifiable ‘French style’ of flute playing, characterised by light tone, rapid vibrato and what Louis Fleury described as a ‘full sound’ and which can be traced back to exceptional virtuosi such as Taffanel, Gaubert, Marcel Moyse, Barrère and René Le Roy, and which continues to the present day via the likes of Rampal, Gallois, and Artaud. Little wonder then that the tradition extends to composition, and to a formidable repertoire of renowned French sonatas and concertos, four of which feature on this Nimbus Alliance disc. The soloist is the veteran American flautist and conductor Ransom Wilson who has featured on a series of Nimbus discs of French flute chamber music over the last few years. In the case of the present issue, the best-known work by far is the concerto Jacques Ibert wrote for Moyse in 1933. 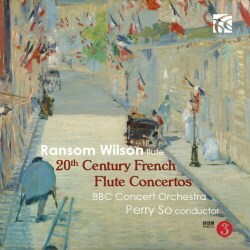 It’s the only piece here which requires a full orchestra, and is played with cool grace and very Gallic flair by Wilson, who projects the vivacity and high spirits of the outer movements without recourse to empty virtuosity and illuminates the somewhat elusive tenderness of the central Andante. The young Hong Kong born conductor Perry So leads a fresh, vernal response from the BBC Concert Orchestra in sound is that is full-bodied and immediate as might be expected from any recording made in the Watford Colosseum. The three other works involve string orchestra accompaniment, and the work by Jean Rivier is the only other piece here actually designated as a concerto per se. Rivier seems to be one of those French composers born around the turn of the twentieth century who has been largely forgotten, perhaps as a result of not being especially tied to a particular ‘school’ or ‘dogma’ (others in this unfortunate boat include Marcel Delannoy and Marcel Mihalovici). Vincent Giroud’s informed note links him to Pierre-Octave Ferroud’s loosely aligned Triton group but the fact is that his music rarely surfaces. His brief concerto was written for Jean-Pierre Rampal and is light on its feet and superficially attractive, most obviously so in its motoric finale, and while it’s educative to hear Wilson’s committed reading, I found the work eminently forgettable, alas. Jean Françaix continues to maintain a foothold in the repertoire; he had an ear for a catchy tune while his orchestration tended to embrace lean but approachable neo-classicism. His Impromptu was a late work designed as a competition piece; it plumbs no great depths but its melodic material especially in its first two sections is certainly appealing and actually rather memorable. But for me the take-away in this miscellany is undoubtedly Jean-Michel Damase’s Sérénade for flute and strings from 1956. This was also written for Rampal, and I like it because to my ears there are hints of darkness here which go somewhat against the grain of the stereotypical French flute concerto. All three movements are marked Très Large, (according to Giroud this implies “with eloquence and breadth”, in other words Fleury’s “full sound”, which Wilson projects accordingly, particularly in the Sérénade’s terser episodes) The opening Allegro –scherzando starts with a sharp rising motif in the flute against a pizzicato accompaniment which is the germ from which its melodic material arises – this music is austere in the way some of Frank Martin’s concertos and ballades are – the tune is insistent and mellows in the central section; the Honeggerian opening of the central Allegro is slightly unsettling, almost nostalgic with an arioso-type commentary from the soloist before it resolves into a tune that verges on the twee but doesn’t quite get there. The material that opens the Andante finale recalibrates the opening material of the central movement. The accompaniment becomes oddly hypnotic, a dream perhaps involving an object of desire which remains tantalisingly out of reach. It is the piece on the disc I repeated immediately; despite the discreet shafts of sunlight which intermittently break through there is definitely something ‘other’ about this work. Damase has impressed and surprised me before, most notably in his half-hour Symphonie of 1952, recorded by this orchestra under Martin Yates for Dutton a few years ago (read Rob Barnett’s review). Much of this music may well brighten your day, or your mood. All four performances are well-turned and congenial and the Nimbus sound is first rate. In the Ibert, the Françaix, and to a lesser degree in the Rivier you will encounter all of those qualities you would expect to find in a French flute concerto; wit, grace, vivacity, tenderness, playfulness, elegance, warmth, ‘Gallicness’, all words that are difficult to avoid in reviewing such fare. The Damase work offers something a little stranger, a little odder; mais il n’est pas profond! And thus I return to the second question I posed at the outset. I never really enjoyed a flute concerto until I encountered Carl Nielsen’s contribution to the genre, a piece of singular strangeness, and a work I still love. Another example that I find takes me out of my comfort zone is Sofia Gubaidulina’s ‘The Deceitful Face of Hope and Despair’, superbly performed on a 2006 BIS CD (review). But the real reason I raised the question is this. By far the most beautiful, and by some distance the most thought-provoking and profound flute concerto I have ever encountered has never even been recorded. It is Robert Simpson’s, one of the last, and best things he ever did. I heard it on the BBC not long before he passed away in 1997. It was played by Jennifer Stinton. My imperfect off-air recording of it is a treasured possession. Given that they have recorded virtually everything else in Simpson’s output, I am perplexed that the Flute Concerto seems to have passed Hyperion by. Perhaps one of their people will read this review….